Just some of the local suppliers used at the Foresters Arms. A small but fantastic local bakery, providing the highest quality breads and cakes, baked on the premises in Fordingbridge. The Isle of Wight's friendly family run catering wholesaler delivering all around the Isle of Wight, Hampshire and the New Forest. Big enough to Compete, small enough to Care. Peter Treble Family Butchers have been serving the local community for over 35 years with a range quality meats and farm produce. A Hampshire based traditional family run dairy supplier. Produced on the farm on the Isle of Purbeck this is ice cream heaven! No artificial rubbish in sight just good old fashioned ice cream made with fresh milk and thick double cream from their own dairy herd and flavoured with some mighty fine ingredients and some whacky ones too - red chilli ice cream? Blows your sock off! Deliciously scrummy award winning local cheeses from Salisbury! 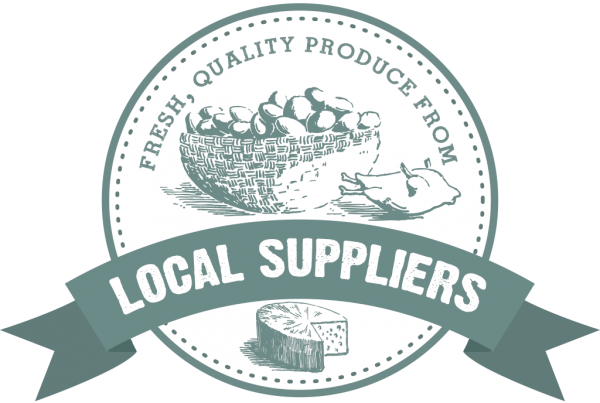 Hampshire farmers and suppliers of quality locally sourced meat for over 400 years. The best meat about these parts in our humble opinion! Coopers are local suppliers of quality fish. Our man turns up complete with muddy wellie boots fresh from his watercress beds in Alresford - which is of course the home of English watercress.